Wavefront users are responsible for finding anomalies in their data. That task becomes harder as the amount of data increases. Wavefront already includes anomaly detection based on statistical functions such as standard deviation. 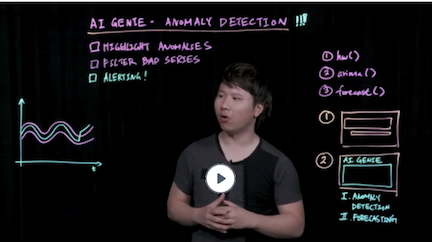 AI Genie takes a different approach, offering anomaly detection based on forecasting. AI Genie offers an alternate view of your chart data that is focused on anomaly detection and forecasting and that supports two main use cases, anomaly detection and forecasting. Assume that SRE Robin has received an alert that an application is slow. Robin reviews the dashboard that monitors the application, but cannot immediately see a problem. Robin switches to AI Genie, sees that an area is highlighted, and filters to see only the anomalous behavior. Robin shares the results with the team, and creates an alert for anomalies on this time series to ensure the team is notified in case of similar problems. Assume that Jo, an application developer, works on the backend database technology. In the company environment, each instance of the application is dedicated to a different customer, so the instances can be sized independently depending on customer usage. Jo needs to know several weeks ahead of time when the instance has to be expanded, and uses Wavefront to look at a chart that shows usage of the service over the last few weeks. 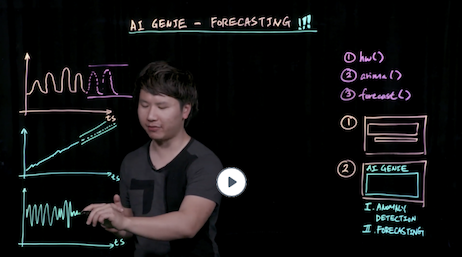 Next, Jo switches to AI Genie and selects Forecasting to see how the Wavefront AI algorithms predict what saturation levels will look like for the next four weeks. Jo adjusts the historic sample size to 5 weeks, and selects a conservative confidence factor. Even with conservative forecasting, saturation will be above 90% in 25 days. Jo initiates a change request to scale the cluster during the next change window. Jo also saves the chart to a new dashboard – that dashboard will be useful later for exploration of other metrics associated with the same change window. You can access AI Genie from any chart and display and customize the Anomaly Detection and Forecast pages. Hover over the query and click Open AI Genie below the query. AI Genie opens in a new browser tab, with Anomaly Detection selected initially. With Anomaly Detection selected, you can customize the Display Settings, Historical Sample Size, and Sensitivity. You can focus on individual time series just as you do for other charts. For sensitivity, High means that there’s a 67% chance that the data is anomalous, Medium means there’s a 95% chance, and Low means there’s a 99% chance. Click Save To > Save as New Alert to save the anomaly query as an alert. When the Create Alert page displays, you see that the anomalous function is part of the query. You do some alert customization, but several settings are optimized for anomaly detection. Select Forecasting to explore forecasting for the current set of time series. You can customize the historical sample size and confidence. If you display confidence bands, they change as you select a different confidence factor.